While for many people the motorcycle season was already over, at the end of October I spontaneously went off-road to the border area of ? ?Italy and France. Meanwhile, the Ligurian border comb road is regulated and toll road. Click here to view the route in Google Earth or here to open the map in a new tab. until he matched my passport with the terrorist databases of the world. But which terrorist is already traveling through Switzerland when the borders with France and Italy are open? It is indeed time that Switzerland also joins the Schengen Agreement, so that such harassment by the German authorities in the future have an end. In spite of everything I drove the same day over the Grimselpass GPS 46 ° 33'41.04 "N 8 ° 20'15.29" E, Furkapass GPS 46 ° 34'20.68 "N 8 ° 24'53.51" E and St. Gotthardpass GPS 46 ° 34'21.66 "N 8 ° 33'39.12" E and camped near the Italian border as always wild. The next day, the customs officers waved me through the entry into Italy, despite the balaclava without problems. I drove past Locarno to Torino. Here I went and was glad to finally be able to leave this city on the next best, toll motorway. So I did not arrive in Susa as planned, but in depot near Chambons and Usseaux, where I stayed overnight. The next day, a narrow paved road, closed from the 1st of November to the end of May, took me up to Fort Serre Marie GPS 45 ° 2'58.43 "N 7 ° 2'53.82" E.
From there, an easy dirt road leads up to a crossroads. On the left, the so-called Ligurian border comb road in Piedmont, which is actually called Assietta comb road or Strada dell Assietta. The actual Ligurian border comb road leads from the Tendepass GPS 44 ° 8'60.00 "N 7 ° 34'0.00" E to the sea in Ventimiglia. The Ligurian has in the middle part of 70 km of gravel without descent, to the northwest still some beautiful slopes and a fairly difficult route down to Ventimiglia. The LGKS is in the middle part much more demanding than the Assietta and landscaped even more beautiful. You drive on a total of over 100 km from barren, rocky mountains down through olive groves to the sea, see here and here and here . The Assietta is closed on 2, 5, 9, 12, 16, 23, and 30 July, as well as on 2, 6, 9, 13, 16, 20, 27, 27 and 30 of August for motorized vehicles. I turned right and drove up to the 2178 m high Colle delle Finestre GPS 45 ° 4'19.94 "N 7 ° 3'10.76" E, which is also closed in winter from early November to late May. The way down to Champo was initially graveled, the last approximately 20 consecutive turns of the pass were paved, but thickly covered with leaves. I refueled in Susa and drove on to Eclause and Monceilier. From here take a very nice, easy-to-drive gravel road past Fort Pramand GPS 45 ° 3'49.41 "N 6 ° 50'25.39" E over the 2596 m high Col Basset continue 2.805 m up to the Mont Jafferau GPS 45 ° 5 ' 1.93 "N 6 ° 46'10.44" E.
On the way, this approximately 40 kilometer long route offers various highlights such as Rouinen, a very beautiful view of the valley as well as some interesting, unlit tunnels GPS 45 ° 4'33.12 "N 6 ° 49'36.60" E.
Before entering such a winding tunnel you should honk especially in the summer. There is no possibility to avoid any oncoming traffic. From a round sheet metal with red edge that lay like accidentally on the roadside near Pramand, I could not stop me. I enjoyed the beautiful area and the cold but sunny weather. The initially very steep path on the other side of the Mont Jafferau past a cable car station down into the valley is closed. In addition, as thick fog with a visibility of only a few meters arose, I drove back to the Col Basette and from there a very steep, bumpy path which is not closed past some alpine huts and a flock of sheep down to Jafferau, la Roche and on to Oulx. After eating delicious I drove via Bardonecchia to Rochemolles. Here I stayed in a vacant caravan. The next morning, I considered leaving my tent as well as my two sleeping bags and other things in the caravan to save weight on the way to the Col de Sommeiller GPS 45 ° 8'0.32 "N 6 ° 50'37.12" E.
However, I decided against it, if necessary, to be able to stay overnight on the pass of the Alps, which is legally operated at 3009 m, in case my motorcycle should be damaged so badly for whatever reason that I do not repair it immediately despite my tools in the luggage can. (Since June 2007, the mountain station of the Bontadini Lift has been the highest approachable point in the Alps GPS 45 ° 56'38.49 "N 7 ° 42'30.80" E. Unfortunately, this road has been in use since 2009 on the basis of a law of April 22, 1985, No. 17 without special permission for vehicles locked.) All my precautionary measures turned out to be unnecessary. Slowly meandering the gravel road medium difficulty, which is closed from June 1 to September 30 on Fridays, Saturdays and Sundays for motorized vehicles, the Mont Sommeiller. First I passed a dam, then the tree line and finally the open barrier. It went on. The higher I got the colder it got. However, this had the advantage that the mud in the corners from a certain point was no longer slippery but frozen and so neat grip for the tires offered. In addition, the motorcycle is not dirty, otherwise threatening 14,000 euros penalty and confiscation of the machine. Slowly I came into the clouds and it was icy cold. Finally, I reached the plateau before the driveway to the actual summit. Here the clouds tore open and lay like thick cotton wool under me. I received blue sky and blazing sunshine. The hoarfrost glittered on the rocks at the edge of the path. In my black clothes I was quickly warm again, but perhaps that was also because the way was demanding and required more driving commitment. On top of the Mont Sommeiller runs the border between Italy and France. Here I parked my motorcycle at the barrier and walked the last few meters past small snowfields up to the summit. There I enjoyed the complete silence and seclusion in the midst of rugged rocks. On the way back the sun was shining everywhere. The night I spent again in "my" caravan. The next morning I refueled and continued driving past the Mont Chaberton GPS 44 ° 57'48.59 "N 6 ° 45'8.42" E to Embrun in France, which can only be reached via a totally dilapidated military road. From Embrun, a small asphalt road leads to Crévoux and on to La Chalp. 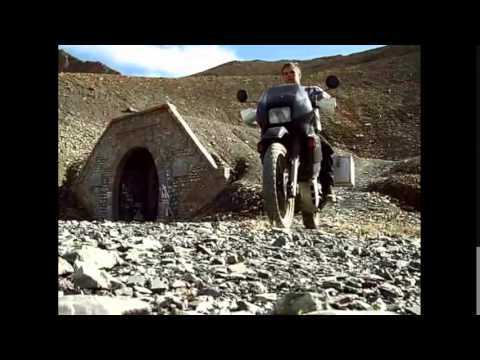 In La Chalp begins the very beautiful and motorized vehicles open gravel road up to the single-lane and unlit tunnel du Parpaillon at 2650 meters GPS 44 ° 29'23.94 "N 6 ° 38'40.12" E.
In this narrow tunnel, the water drips from the ceiling, making it very muddy and slippery on the ground. Here I met two Italians who were driving their BMW motorcycles. while one did not have a problem with his HP2, the other had just put his new GS 1200 ship in the tunnel. Fortunately, except for a few scratches, nothing happened. We talked with hands and feet before the two drove back to Turin and I continued my way to St. Anne and on to la Condamine at 1286m. Here you have to know that you have to turn right direction Jausiers on the D900, because there is no sign. Jausiers is located at the foot of the Col de Bonette, the highest asphalted pass in the Alps at 2802 m, whose GPS coordinates GPS 44 ° 19'14.76 "N 6 ° 48'22.97" E decorate the tank of the successor model of the Honda Transalp. The asphalt of the D64 was in very good condition, so that I could finally let it rip again after the many gravel roads. In quite warm weather, I approached the summit in low altitude flight, which, however, has little to offer apart from black earth and some old ruins, bunkers and military installations. However, he is after all the target of the comparison trip Alpen Masters 03.08.2012 of the magazine "Motorrad" issue 17. Underneath the Col de Bonette is the Col de la Moutiere GPS 44 ° 18'55.09 "N 6 ° 47'45.19" E, which can be reached via a slight dirt road and also has some old military installations. In the evening I got in Jausiers by a craftsman who was just closing time allowed to camp between many architecturally very beautiful single-family dwelling sheltered in a shell. Although it was quite warm during the day, it was surprisingly cold at night. When I wanted to refuel the next morning, my bench was covered with hoarfrost. Refueling is a problem in France, especially on Sundays, as most gas stations are closed and the fuel terminals, unlike those in Italy or Switzerland, do not accept 10 euro bills but only card payment. So once again I had to rely on a friendly person who kindly lent me his card for cash and served me the French-language machine. Then I made another lap on the Col de Bonette GPS 44 ° 19'14.76 "N 6 ° 48'22.97" E, before I made my way back and again the nice dirt road up to the Col de Parpaillon GPS 44 ° 27 ' 32.74 "N 6 ° 44'36.41" E drove. This time I met a young couple up there in their Nissan Patrol. The two offered me hot coffee and told me that some years ago they were also on motorcycles. A few meters below the tunnel, I suddenly met a group of people with 3 quads and two trail bikes in the closed terrain were traveling. I joined them for a while to film with the camera I had attached to my left mirror with the help of a small tripod. Suddenly the one driver of the trail bike went out of fuel. The 40-kilometer route was probably too far. Unfortunately, the people had no hose, etc., to be able to pour fuel from my tank, but fortunately, it went to La Chalp almost only downhill. My way led me back to Italy, more precisely on the SR23 to Sestriere GPS 44 ° 57'58.76 "N 6 ° 52'52.49" E.
2536 meter high Monte Evris, the 2381 meter high Col Belegier, the 2497 meter high Col Lauson, the Monte gran Costa as well as the 2472 meter high Col del Assietta to the Col delle Finestre and on to Meana di Susa GPS 45 ° 7 ' 5.38 "N 7 ° 3'45.53" E leads. Strada dell 'Assietta, which is suitable for passenger cars, had a lot of traffic today last Sunday before being locked in winter over the winter. Here I not only met a whole family with two KTM motorbikes and a quad on the way, but also a lot of cars, ranging from the Fiat Panda to the Mercedes M class. In general, the Assietta Kammstrasse is a paradise for off-road drivers of all kinds. Again and again you can see narrow, steep paths up to other summits, for which my loaded motorcycle was too heavy. As it was getting late and I was tired after the quite strenuous route I drove again to Fort Serre Marie where I pitched my tent . Unfortunately, I did not have the freedom to brush my teeth in the morning. My water bottle contained only a lump of ice. In good spirits, I packed my things together again to drive the Strada dell 'Assietta with a view of the clouds below me. This time I met people traveling with a Honda and an old BMW GS, before I drove over the Coll delle Finestre and through the thick cloud cover to Susa. It was raining down in the valley and it did not stop raining until I reached Locarno in the evening. The next morning, the rain turned to snow as I drove over the St. Bernadina Pass , as both the Grimsel and the Furkapass and Col de Turini, Col de Tende, Col de Braus, Passo della Spina GPS 45.791781 ° 10.439189 ° and Passo di Fraela N46 ° 29'59 "/ E10 ° 18`23" as Forcella Lavardet were closed. As you can see, I was not only lucky that my motorcycle withstood the tough off-road use and only one screw was broken on the bellman, but also that the weather had played so long.